Welcome to the home of the West Morris Mendham High School Choirs! Save the date for next year's Cabaret Night - Friday, February 9, 2018! ​I am so excited to start a new year of singing! Below, you will find information regarding choral events for the 2018-19 school year. Please visit the Concert Choir Calendar. This calendar only includes events that pertain to Choir Classes. Be sure to put all dates into your calendar now, and ask the students to do the same. Students may also look at the Powerschool Learning calendar for dates; however, this calendar includes all choral activities. The students will be wearing formal attire for the Messiah Concert. The girls will be wearing dresses and boys will be wearing tuxedos. The school owns tuxedos which will be loaned to the boys, but the boys are responsible for buying a tuxedo shirt and for dry cleaning the tuxedo after the concert. The girls will be responsible for buying the uniform dress, which they may sell back for $40 after their senior year. In order to help defray the cost of this, we will have a “Cheesecake Sale” fundraiser. Many of our students cover the entire cost of the garments with their proceeds from the sale. You will be receiving information about the Music Boosters via e-mail. The Music Boosters Organization supports the programs of the Choir, Orchestra, and Band at Mendham HS in various ways. From logistical support at the Messiah Concert, to concert refreshments, and Cabaret Night organization, the Music Boosters Organization is there to help the teachers with our needs throughout the year. Without the help of parents, many of the programs we run simply could not happen. I would love to see more choir parents get involved with the program this year! We will primarily be using Mail Chimp to communicate with students and parents regarding upcoming events in the choir and music department. Please sign up for this communication at this link. If your student was in band or orchestra in the past, you will need to add choir to your preferences in order to receive our emails. Mrs. Nancy Alam is the Music Boosters Vice-President for the choir this year. You will be hearing from her throughout the year with reminders about rehearsals, performances, and other choir events. Please add her e-mail address to your address book to be sure you receive all communications - alamnancy4@gmail.com. You can also contact Nancy with any questions you may have throughout the year. This website will be used to post concert dates and other information about the choir and the music department. This will be our main point of contact with parents, aside from direct e-mail. The students will use the class Powerschool Learning page for assignment information and calendars. We also have a Facebook Page in order to keep improving communication with students and parents. 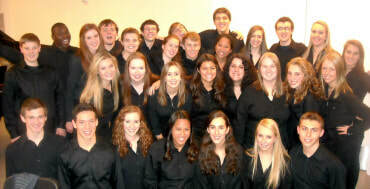 If you would like to receive additional updates, please like our page "Mendham High School Choir". Music Alumni can join our facebook group, "West Morris Mendham Music Alumni". I look forward to meeting you throughout the year at concerts and other music department events. If you have any questions please contact me via e-mail – pdanner@wmrhsd.org, or phone – 973-543-2501, ext. 4745. Thank you in advance for all of your support throughout the year! sign up for mail chimp here!